I’m of the opinion that Hot Cross Buns should only eaten to be at Easter time despite the supermarket sales campaigns that generally begin soon after Christmas, so, each year in the lead up to Easter, I begin experimenting with perfecting 100% Spelt Sourdough Hot Cross Buns for my family. I seek to make buns that are dense and moist, buns that have a delicious balance of warm spicy sweetness, buns that are studded with soft vine fruits, buns that so delicious that you find it hard to say no to more than one. My sourdough Hot Cross Buns also need to be gut friendly so a long fermentation is necessary and in this case it was 20 hours. These buns are lactose free, cane sugar free and the amount of currants used is deliberately controlled to make them low Fodmap. Begin by activating your sourdough starter. Mine takes about 6 hours to boogie. Put the currants into the mixing bowl then pour over the liquids. Wash the bowl and lightly oil the inside with coconut oil. Return the dough to the bowl, turn the dough over so it’s coated in oil then cover and set aside for 45 minutes. Tip the dough onto the bench again then gently stretch the dough as thinly as you can before it tears. Fold the dough into a boule, return it to the bowl, cover and set aside until doubled in bulk. Gently release the gases from the dough, cover the bowl and place in the fridge overnight. The next day, about three hours before you intend to bake, remove the dough from the fridge and gently tip it onto the bench. Shape each piece of dough into a ball by folding it in on itself until the outside surface shows no exposed fruit. Cover the buns with a piece of greased baking paper and a tea towel and allow to rest in a warm place for 1 -1 1/2 hours or until slightly risen. Crosses: Make a thick slurry with 2 heaped tablespoons of gluten free flour, pinch of baking powder and 3 tablespoons water. Reduce the heat to 200C and bake for a further 15 minutes. When the baking time is complete remove the buns from the oven and brush the tops generously with the glaze. Return the buns to the oven for 1 minute. The Chai Tea sounds like a fabulous addition Sandra… along with the extra spices, these buns must be packed full of flavour! Can imagine how good your kitchen must have smelled while they were in the oven. The aroma was magnificent Margot, very happy with the flavour too, not too sweet. Hot Cross Buns have become, for me, almost as anxiety producing as the Christmas turkey and pudding! I will give these a go Sandra because they look wonderful and the recipe sounds so delicious. Oh no, it shouldn’t be that way. There is nothing challenging about this recipe, just the normal sort of bread making routine. Good luck.. They look great Sandra, I think you’ve nailed it. I do so agree with you that HCBs are only for Easter time. They would lose their special appeal if they become too common all year round. I was thinking about getting my HCB recipe out to make some for our students here in Greece. Orthodox Easter is a bit further away, so I have time. Yours rise nicely and I love the idea of a long rise time. I must also try to put mine closer together. Tweaking never stops. If I can also add my twopence worth…. Divine. I would be happy with ’16, ’17 or ’18. I have an opinion too, any Hot Cross buns that look as delicious as yours should be eaten ASAP. This cycle should then be repeated as often as possible. They look awesome, Sandra! 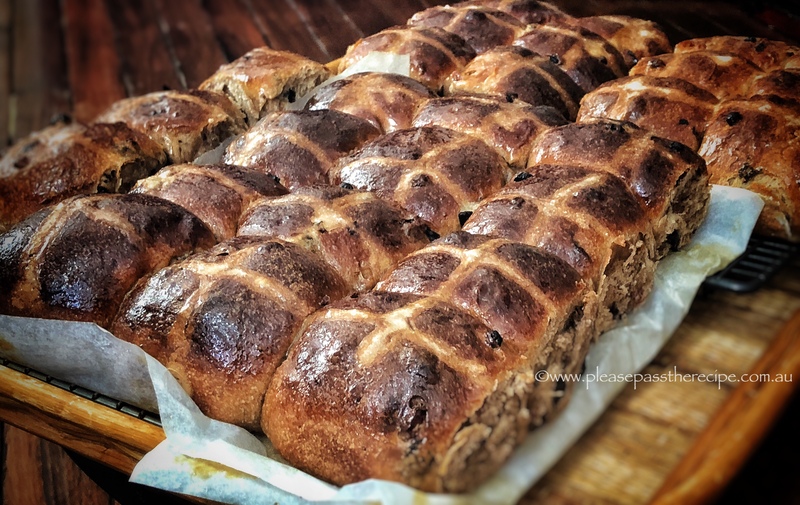 This entry was posted on March 22, 2018 by ladyredspecs in Baking, bread, Breakfast and Brunch, Cooking, FODMAP diet, Food, recipes, sourdough bread and tagged 100%spelt sourdough hot cross buns, Baking, Easter, easter buns, FODMAP diet, hot cross buns, sourdough, sourdough baking, sourdough hot cross buns.